Today is part six, and the final segment, of my Natural Remedies Blog Series. I hope you have found this series useful and filled with practical information! Today’s topic? Natural Remedies for Blocked Fallopian Tubes! What do your Fallopian Tubes do? When an egg is released from one of the ovaries, it travels through one of the fallopian tubes, which are narrow ducts that connect the ovaries to the uterus. Normally, the egg will join with the sperm in the fallopian tubes during conception and the now-fertilized egg will continue on to the uterus. However, the fallopian tubes are extremely fragile. When an obstruction prevents the egg from traveling down the tube, the woman has a blocked fallopian tube. It can occur on one or both sides. This is also known as tubal factor infertility, and is thought to be the cause of infertility in 40% of infertile women. What are signs & symptoms of Blocked Fallopian Tubes? Unfortunately, there are rarely signs of blocked fallopian tubes, and women often don’t know they have blocked fallopian tubes until they are trying to get pregnant and are running into issues. If you have ever suffered from pelvic inflammatory disease, there is a good chance that your tubes are blocked, as doctors estimate that at least three out of four women that have had a sexually transmitted disease do suffer from tubal blockage. 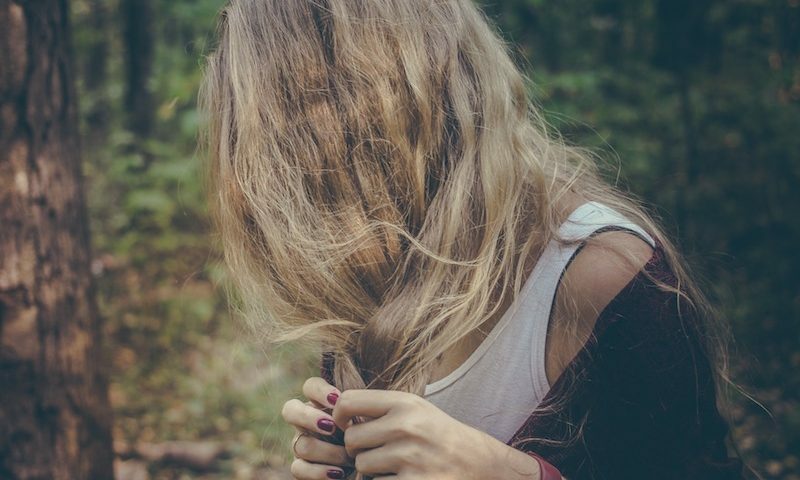 A specific kind of blocked fallopian tube, called hydrosalpinx, may cause lower abdominal pain and unusual vaginal discharge, but not every woman will have these symptoms. Hydrosalpinx is when a blockage causes the tube to dilate (increase in diameter) and fill with fluid. The fluid blocks the egg and sperm, preventing fertilization and pregnancy. Hysterosalpingogram (HSG) is an X-ray test, using a contrast dye to view any obstruction in the fallopian tubes. Chromotubation is similar to hysterosalpingogram as it includes dye being passed into the uterus and fallopian tubes as well, though this test is done laparoscopically. Sonohysterography is a non-invasive procedure where ultrasound imaging is used to determine if there are any abnormalities of the reproductive organs. The most common cause of blocked fallopian tubes is pelvic inflammatory disease (PID). PID is an umbrella term for a number of different problems that create an inflammatory infection in the female reproductive system. PID is usually the result of a sexually transmitted disease, but not all pelvic infections are related to STDs. Also, even if PID is no longer present, a history of PID or pelvic infection increases the risk of blocked tubes. These conditions can cause fallopian tube blockage by causing adhesions, scar tissue, tumors or polyps to form inside the path of the tube. The fallopian tubes may also become stuck to other parts of the internal body—the bladder, ovaries, uterus, bowels, etc. Damaged fallopian tubes can become twisted or the walls of the tubes themselves may adhere together causing a total blockage. Partially damaged fallopian tubes may remain open enough for pregnancy to occur, but a partial blockage increases the risk for ectopic pregnancy. How do Blocked Fallopian Tubes affect fertility? Each month, when ovulation occurs, an egg is released from one of the ovaries. The egg travels from the ovary, through the tubes, and into the uterus. The sperm also need to swim their way from the cervix, through the uterus, and through the fallopian tubes to get to the egg. Fertilization usually takes place while the egg is traveling through the tube. It’s also possible for the tube not to be blocked completely, but only partially. This can increase the risk of a tubal pregnancy, or ectopic pregnancy. What are some Natural Remedies to help with Blocked Fallopian Tubes? There are many ways to naturally treat blocked fallopian tubes! As with any major diet and lifestyle changes, it takes at least 6-12 months of consistent change, along with natural therapies to bring about real change in the body when living with blocked fallopian tubes. So don’t give up when things get tough, I promise that these changes will be worth it in the long run! The enzymes found in papaya and pineapple will work wonders for promoting circulation in your fallopian tubes, while detoxing the built up tissue. 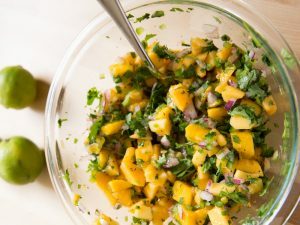 So what better recipe to introduce than a Pineapple Papaya Salsa? This salsa is great served with grilled fish or pork. Let’s be honest though … it’s also incredible with consumed with gluten-free tortilla chips! In a bowl combine all ingredients and let stand at room temperature 1 hour. Salsa may be made one day ahead and chilled, covered. The longer it marinates, the spicier it gets ;). Serve at room temperature. Vitamin C: Vitamin C is required for the absorption of iron. In addition, it boosts immunity and fights infections. If your fallopian tube blockages are due to infections or inflammation, vitamin C may help clear them. Inflammatone: Inflammatone contains a blend of proteolytic enzymes. Systemic enzymes help to eat away and reduce fibrin (the material that makes up scar tissues) over time. The same enzymes work to promote healthy circulation and detoxification of tissues. This type of therapy is extremely promising for helping the body to reduce excessive scar tissue and inflammation. Lifestyle changes are some of the most effective ways to help naturally cure your blocked fallopian tubes. The following lifestyle suggestions compliment your dietary and nutrition changes. I suggest implementing as many of the following as possible. Use recycled unbleached paper products. Use non-chlorinated oxygen based bleach in the laundry. Pelvic Massage helps the body to clear blocked fallopian tubes. The act of massaging helps to break up scar tissue, increase circulation (to aid in tissue elimination), reduce inflammation, and it helps the body to loosen tight or twisted tissue. I highly recommend that you find a massage therapist who specializes in abdominal massage. A Castor Oil Pack is a cloth soaked in castor oil which is placed on the skin to enhance circulation and promote healing of the tissues and organs underneath the skin. To support hormone health, I recommend clients place the cloth soaked in castor oil on your lower abdomen, where your ovaries and uterus live. You can also place the cloth over your liver to support optimal hormone detoxification. There are immune enhancing, anti-inflammatory, and antimicrobial herbs that are capable of enhancing your immune system so that it can help naturally unblock your fallopian tubes. Goldenseal Root: This herb is extremely antibiotic, antimicrobial and anti-inflammatory. The herb works on the mucus membrane that lines the fallopian tubes on the inside and tones it so that the infection is warded off. It works to heal any infection in the reproductive system, while also reducing pain and inflammation from foreign tissue growth. Echinacea: This herb works to enhance your immune system. The roots of this perennial herb are generally used to cure flu and cold. The herb has additional properties such as antimicrobial and anti-inflammatory. The herb will help your body fight against the infections that cause blockage of the fallopian tubes. Once that is done, your tubes will clear out automatically. Dong Quai Root: One of the best herbs for promoting circulation to the reproductive organs. Dong Quai acts on the circulatory system and lymphatic system reducing tissue congestion. It has both pain reducing and anti-inflammatory properties. Hawthorn: This herb works to reduce abdominal congestion. Hawthorn is extremely high in antioxidants, improves the integrity of blood vessel wall, aids the body in proper oxygen use and improves blood flow to your fallopian tubes. Ginger Root: A wonderful herb used to increase circulation and promote blood flow to the reproductive organs. The increased circulation also helps to reduce inflammation of the uterus, ovaries or fallopian tubes. 1. Blocked Fallopian Tubes, also known as tubal factor infertility, are thought to be the cause of infertility in 40% of infertile women. 2. Partially damaged fallopian tubes may remain open enough for pregnancy to occur, but a partial blockage increases the risk for ectopic pregnancy. 3. You CAN naturally unblock fallopian tubes through diet and lifestyle changes! Have you been diagnosed with Blocked Fallopian Tubes? What’s your journey been like? If you suffer from Blocked Fallopian Tubes, what natural remedies do you use to ease them? Spread some Natural Remedies for Blocked Fallopian Tubes lovin’! Sharing is caring, and I bet you have some friends who would love to read this too :). Looking to have a more in-depth conversation about how to naturally treat Blocked Fallopian Tubes? Schedule a consultation with me!